10' x 14' Quick Ship Riverside leaves our factory in 72 hours. 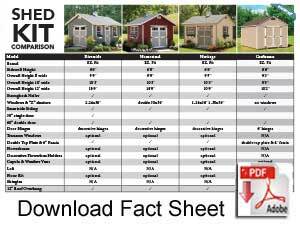 Designed to offer plenty of light and easy access, the EZ-fit Riverside shed features a single door flanked by two 24" x 36" windows, in addition to its convenient double doors. Quickship Package includes optional transom windows and is ideal as a backyard studio or workshop. Quickship package available only in 10x14'. Made in the U.S.A.
Transom windows in double & single doors.